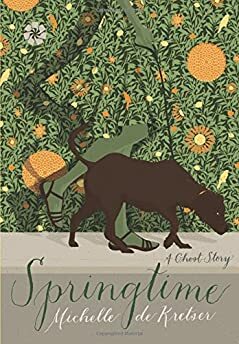 Largehearted Boy: Book Notes - Michelle de Kretser "Springtime"
Book Notes - Michelle de Kretser "Springtime"
Michelle de Kretser's novella Springtime is a poignant and eloquent ghost story. "A dark gem of a book . . . .One reads Springtime not for its shock value--this tale is much more subtle than that--but for the way De Kretser explores the nature of ambiguity and for her deliciously unsettling descriptions." 1. I'm pretty sure that Frances, the main character in Springtime, listens to classical music while researching and writing. So my first choice is the first piece from Schumann's Scenes from Childhood. The piece is called 'Of Foreign Lands and Peoples' and Frances, who has moved to Sydney from Melbourne, sometimes feels herself to be living in a foreign land. Also, it's a haunting work, which suits a ghost story. Frances is rather child-like herself, and the book also features her partner's child, with whom Frances has a rather uneasy relationship, so that's another reason why I've chosen this music. 2. When Frances first meets Charlie, he is married to someone else. Throughout their relationship, Frances is haunted by Charlie's past. So the second track I've chosen is 'The Dark End Of The Street' by James Carr, a wonderfully melancholy song about illicit love. 3. Really, there was no choice involved when it came to the third track: it had to be 'Walking The Dog' by Rufus Thomas. Frances is walking her dog by the river when she catches sight of a mysterious woman whom she comes to think might be a ghost. I walk my dog by that same river every morning, and it was something I saw there that set me writing Springtime. 4. Springtime is set in Sydney, and its streetscapes and lush climate are very much part of the book. So I wanted to include a track about Sydney, and I was surprised to that there aren't many – Melbourne seems to have inspired far more songs. Still, I did manage to find one, by Paul Kelly, who is probably Australia's best known singer-songwriter (although his songs about Melbourne and Adelaide are far more popular!). So my last track is his 'Sydney From A 747' – which is fitting, as Springtime ends with Frances waiting to catch a flight out of Sydney.